I recently some of the city building game Concrete Jungle. 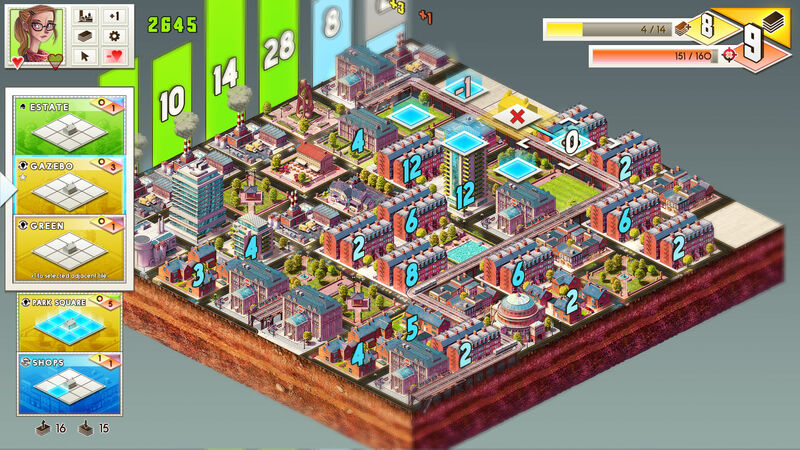 Wheras games like SimCity and Tropico are city simulations, Concrete Jungle is first and foremost a puzzle. A game in Concrete Jungle opens with seeing a small section of a city already filled out, quickly moves the camera to focus on an empty field of land. To play, the player places buildings from their deck of cards displayed along the left. Each row of the city must meet or exceed the minimum score listed along the side. To earn points, the player first places a residential development. Developments don’t have any points on their own, but are improved (or degraded) by buildings around them like shops or parks. Once the player ears enough points in a row, they ‘clear’ that row, much like in Tetris. If they place buildings in such a way that it becomes impossible to clear that row, they can either leave that row to add up space on the board or to expend a life to forcibly clear it. There’s also a deck building mechanic and a difficulty ramp system, but the core of the game is a tile puzzle fueled by a deck. I really like the use of randomness through the use of the deck and the ability to select from several possible cards, but the row-clearing mentality is unabashedly pro-expansion. You expand onwards forever (or until you meet the goal of the level). Though certainly a really interesting and quite fun take on the city building genre, I still want something a little more political.